Workpiece size to 60" x 120"
Workpiece size to 60" × 120"
Workpiece size 60" × 120"
Cuts 10 Gauge mild steel, 10 Gauge stainless steel, .160 aluminum. Maximum Axis Travel: X=50", Y=20", Z=25"
3HP table size 23 1/2" x 58 1/2"
5 HP table size 31 1/4" x 98 1/4"
Belt widths 1" - 8"
2 Drill Presses for drilling, reaming, countersinking, etc. Clark Metal Products operates a complete Inspection Department equipped with a Coordinate Measuring machine. This machine provides precise measurements with repeatability and traceability. The system, along with other sophisticated tools and gauges, assures mechanical measurement accuracy. Clark Metal Products operates a complete Printing Department capable of applying ink to all types of metal substrates. We work with screen mesh counts ranging from 330 lines (for fine line graphics) to 175 lines (for bold, solid print areas). Custom colors can be created from color chips or the Pantone Matching System (PMS). 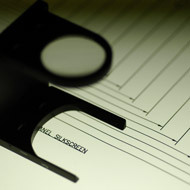 We offer typesetting services, and we can also create screen stencils from customer-supplied artwork. Acceptable drawing formats for artwork are AutoCAD, Corel Draw and Adobe illustrator.